Why is someone reading an article published on TheBlackList Pub - TheBlackList social network, 2 years ago? Who is reading that email you posted 2 years ago? Where is that email you posted 2 years ago? Has anyone read your email? How do you know that someone actually read your email? Why has 771 people read and shared that article published on TheBlackList Pub - TheBlackList social network, 2 years ago? How many people read that email you sent out? Why is it that 79% of the visitors to TheBlackList Pub - TheBlackList social network, are new and first time visitors and readers? How many new people have your email reached? Are you interested in speading your message? Are you interested in reaching new people? What happens to you email once you've sent it? Why has 771 and poeple read that article published on TheBlackList Pub - TheBlackList social network, 2 years ago? Why is it that 79% of the visitors to TheBlackList Pub - TheBlackList social network, are new and first time visitor and readers? Most articles posted on TheBlackList Pub are reposted and shared on other social networks. If you love the Schomberg, you'll value TheBlackList Pub - a database and resource for our future. This is to inform you of a Memorial Meeting for the late Kwame Adjimah. This will take place at the World Vision (Small Hall), Kpodzi, Ho, Volta Region, Ghana, on TUESDAY 19th JUNE 2012 at 1pm. There are people who devote the whole of their youthful years to the course of social justice and Kwame Adjimah was one such person. Kwame Adjimah was educated at Bishop Herman College, Kpandu, Ghana and later at Accra Polytechnic, Accra, Ghana. He was one of those who in the late 1970s and early 1980s could be described as full time Aluta Errand Boys. He was a leading member of the Ghana-Cuba Friendship Society and Editor of its mouthpiece, The Fraternal. He later became Coordinator of the Institute of Friendship with the People's of Latin America (IFPLA). He was also a leading member of the June 4 Movement and the Socialist Revolutionary Youth League of Ghana (SRYLOG). During the PNDC days in Ghana, he started as a cadre of the National Secretariat of the Interim National Coordinating Committee of the People's and Workers' Defence Committees. He was later transferred to the Volta Regional Secretariat of the National Defence Committee and had responsibility for Political Education in the Police PDCs. He was also a member of the United Front of the June 4 Movement and the People's Revolutionary League of Ghana. Kwame was one those cadres detained for the PNDC for their enthusiastic role in campaign against IMF and World Bank dictates in our country. On 19 June 1983, Kwame escaped from detention and was on his way out of the country when he was arrested in Kpedze. On 21 June 1983, Kwame, was sent by Medium Mortar Regiment to Accra and the Search and Destroy team from the Castle met them at Airport Round About where the team killed Kwame and 4 others. The Memorial Meeting on Tuesday 19th June 2012, will be addressed by Kwasi Adu, Chairman of the National Youth Organising Commission during the PNDC days, and Explo Nani-Kofi, the first Volta Regional Coordinator of People's and Workers Defence Committees during the PNDC period. This is also part of a process to recognize all such people who had made contributions to the cause of social justice and have lost their lives. All are invited to this event which is being organized by the Friends of Kwame Adjimah. On Behalf of Friends of Kwame Adjimah. Ghana, 13 June 2012. MESSAGE FROM MOUKOKO PRISO (ELENGA MBUYINGA) – AUTHOR PANAFRICANISM OR NEOCOLONIALISM THE BANKRUPTCY OF THE OAU, CAMEROUN. I beg you to accept these few words to salute the glorious memory of our Comrade and Brother in struggle Kwame Auste Adjimah, who was assassinated some nearly 30 years ago, by what must be termed as pro-imperialist forces in Ghana, because he was defending our common Panafricanist ideas which Osagyefo KWAME NKRUMAH and his comrades like Patrice LUMUMBA(of the Congo) and Félix Roland MOUMIE (of the UPC of Kamerun) left to us all throughout Africa. Comrade Kwame Adjimah has won his place among all African Patriots who devoted their life to the great cause of Revolutionary Panafricanism, for a politically united Africa, for the United States of Africa with a Continental Union Government. We believe that every brother and sister here present who really want to praise comrade Kwame Adjimah's memory will do his best to actively and concretely contribute to the Renaissance of a ALL AFRICA PEOPLES' REVOLUTIONARY ORGANISATION. There seems to be no other way. In this day of remembering him, I would like to beg you to put these my modest words alongside all those who have decided to say something and have been accepted to do so. MESSAGE FROM BABA OLUWIDE (BABAOMOJOLA), NIGERIA, militant trade unionist in the anti-colonial movement in Nigeria. Thanks for the info on the late Cmrd Kwame ADJIMAH. It would be passed round. May the soul of the dearly departed enthuse us to continue the struggle for total freedom to conquest. MAY HIS GREAT WARIOR SOUL REST IN A PEFECT PEACE. PEOPLE ARE ENJOYING DEMOCRACY TODAY BECAUSE PEOPLE LIKE KWAME GAVE UP THIER LIVES. TODAY THE CHIEF EXECUTIONER HAS BECOME A PSYCO. EXPLO I WISH I COULD BE THERE BUT AM WITH YOU IN SPIRIT. THANK YOU VERY MUCH FOR TAKING THE INITIATIVE. NANI YOU ARE THE KIND OF PERSON I CALL A LEADER. AT LAST AM ABLE TO BELEIVE AGAIN THERE IS A FUTURE AND A HISTORY FOR ALL. PLEASE DO NOT LET THIS FLAME DIE OUT. "WE NO GO SIT DOWN MAKE DEY CHEAT US. NEVER AGAIN", THE TRUTH WILL PREVAIL AND NO ONE CAN KILL HISTORY, MAY THE SOUL OF KWAME AND ALL THOSE IN HEAVEN REST IN PEACE. WE SURELY MEET THEM IN HEAVEN. May the souls of all who died on june 19 1983 in GHANA rest in peace. The blood they spilled lead to the freedom we enjoy in GHANA today. I hope the opportunist in the Ghanaian parliament will recognize this day as the day for the fight for freedom when brave young men stood up to a tyrant. MESSAGE FROM EVANS AFENYA, USA, activist at National Defence Committee Secreriat coordinating people's and workers defence committees in Volta and Ashanti Regions. This memorial is very timely and brings to the fore, the memories of all the cadres who were murdered in cold blood years ago as one individual sought to impose and entrench himself in power for clearly selfish reasons and completely counter to the interests of the broad Ghanaian masses. I cannot be at the memorial but I offer all my solidarity in this regard. The memorial should offer all the participants the opportunity to reflect on the past and provide the space for addressing the issues of which way forward for the Ghanaian and African people in their struggles for a better and more egalitarian world. Comrade Kwame and all the fallen heroes will rest in peace and be fondly present in our memories but their struggles should not be in vain! I'll be glad if you could read this to the gathering, should you have time available. Thanks for copying me in - a bold initiative to honour a forgotten peoples' hero and other fallen, genuine, progressive, patriotic comrades. Kwame Adjimah was a fierstly selfless activist, whose exuberance was infectious both in his presence and absence. I recall a few unforgettable moments including running two errands with him pre-1983 from Legon to Ho Mortar Regiment and it was great fun but serious business. Gone too soon; Sorely missed! Let's also not forget those selfless comrades who are alive, but have been severely marginalised such as Ahot-Mensah, also formerly of the INCC/National Defence Committee who is now banished to the Kpetoe District, suffering mental health problems due to frustration and neglect. Will endeavour to attend if in Ghana at the time. Pse find below response to your post re above subject from Micky Tee - Mike Akposoe nee Rev Cyril williams, Canada. I have also copied this to Judd - formerly of NYOC/INCC/National Defence Committee, who is currently Regional Audit Head, Ho whom you may laiase with as appropriate. Thanks for the information. Kwame will well be remembered for his stand as a cadre who stood for justice for the country Ghana. May his soul rest in peace and his vision not perish, but we need to stand up as cadres and continue where we left. Do the four other's names not deserve mentioning and remembered? The four others' names deserve mentioning and remembered. Unfortunately, I set on this programme to remember Kwame Adjimah as a personal friend fallen in circumstances that I could have been in as we were both escaping. It was only on Tuesday that I managed to track down the soldier who drove the military that sent him to Accra and he told me that Kwame Adjimah was killed together with four soldiers. The soldier has not given me names of the others. Getting this type of information is not an easy job. Although, Kwame Adjimah died 29 years ago this is the first time this version is being put in print. The effort I have started to remember may be small but may be able to grow into one to remember all who have fallen. Understand Comrade. Keep up the good work. Aluta! Where is his picture? For those who might have forgotten the face. I have still not been able to lay hands on any picture of his. I am still searching. Amandla Ngawetu!!! We shall alway remember as a dignified tribute and honour to a fellow patriot and nationalist, an Nkrumahist, a strong Pan-Africanist, human rights advocate and a fighter for freedom and justice, Kwame Adjimah a true reliable and adorable comrade. May His Soul Rest In Perfect Peace! So shall all the fallen heroes of the struggle be remembered when freedom comes!!! I salute!!! Kwame Adjimah still lives in my heart as I do remember him like meeting him just yesterday, though my last time meeting him was at the Gonda press office with Captain Nfodjo was in '83 when I had a national assignment to go to the Brong Ahafo and he requested to spare him a brand new golden binoculars I had purchased from Moscow. I had just called to salute the brave young Lt Kwesi Okyere who... led the June 19th attempt to unseat the tyrant fake revolutionary Rawlings and set the captives free with other young bravery brothers. We shall remember all the fallen heroes. A massively spontaneous people's revolution is the only answer for our social-economic transformation for which others has died for our freedom!!! Keep the fire burning. Amandla Ngawetu!!!! Good Comrade, I have forwarded this write-up to Comrade Pratt and i am quiet sure we will be able to attend this programme. Comrade Explo, I salute you, but on this occasion I salute Comrade Kwame Adjimah even more. Being that I did not live in Ghana during those turbulent years, I left Ghana in 1974, several times I get teary when events of this period are reported. I stand with all the comrades to salute Kwame Adjimah for the gallant efforts he made to make life for the youth of Ghana and Africa, who are yet to see any better days in terms of freedom, real freedom, educational and economic opportunity, living on a continent of plenty, to take up the mantle left by Kwame and march on to the make the dream the Osagyefo had for all of us a reality. May He Rest In Peace. WE WILL REMEMBER HIM IN OUR PRAYERS.MAY HIS SOUL RIP. MESSAGE FROM MICHAEL AMUAKWA, GHANA. Dear comrade! Sorry to disappoint you once again. Busy schedule will not permit me to attend. Keep the spirit of the genuine revolution burning. Wherever this week finds us anywhere in the World, may the best of our thoughts be devoted to the inspiring likes of Kwame Adzimah; may we remember that honouring them demands more of those of us still living to rise higher, to more honestly comprehend the lessons of best practice from their strengths and weaknesses as well as from our own failures and successes and all previous efforts, in order to better take forward ever their Freedomfighting banners of yersteryears into the battles for Justice being continuously waged by the suffering masses of our peoples in Ghana today and throughout Afrika and the rest of our contemporary World; for, he was one of those brave and now legendary sons and daughters of Afrika and Nana Asase Yaa, our Mother Earth herself, who dared not only to voluntarily choose early in their youth, but also stoically lived up to the end of their lives, to champion the emancipatory cause of our Wretched of the Earth as genuinely striving, self-sacrificing and lifelong learning aspiring professional revolutionaries sincerely engaged in authentic Pan-Afrikan Liberation pathfinding towards definitively victorious Scientific Socialism! the All-African Students Union (AASU). MAY HIS SOUL REST IN PERFECT PEACE. SALUTATIONS TO ALL THE HEROES BOTH FALLEN AND ALIVE, WHO THROUGH THEIR SACRIFICIAL ACTS MADE LIFE BEARABLE FOR SOME OF US. FORWARD EVER! What did the soldier say about how and where Kwame and others were buried? May I suggest that the memorial meeting ends with something very concrete like the planting of a tree in a public place - where it will nto be cut down - which will have a plaque with Kwame Adjimah's name. This is what my Nicole from Chile has organised for the disappeared which includes her sister. That way, over time young people of even primary school age can become involved and you will not need the meeting to totally depend on any concrete action in order for things to move forward. If they agree to do something - find. And if they don't it does not matter because you will already have done something. You should make a list in Excel and start putting the names of the fallen and have different columns for their personal details. I am in Addis and history is all around me. I pity African countries. They present their whole history as starting from the beginning of colonialism. It is a disaster. Even those who reference the odd kingdom here and there do not make it a living organic part of the present. Explo, my work schedule at the hospital has not made it possible for me to join you this time at the Kwame Adjimah Memorial Meeting. However, I am with you in spirit. The struggle continues. I'd wish to attend but for circumstances beyond control. Wishing you successful programme. MESSAGE FROM GYEKYE TANOH (BARZINI), member of the Socialist Workers' Party and International Socialist Organisation Ghana. Explo, solidarity greetings & best wishes for Kwame Adjimah memorial today. Thanks also for initiative on this. It raises the bar and adds qualitatively to our applied meaning & practices of Comradeship and Solidarity in today's Ghana. MESSAGES FROM RUDOLF NSORWINNE AMENGA-ETEGO I, GHANA, first Regional Coordinator of people's and workers' defence committees in Upper Region. Explo great initiative ! ! I am sure many more will be remembered as the days roll by. I remember his last days with me at Mr Denkabi's flat . . . . . MESSAGE FROM JOHN JARA NUTAKOR, USA, cadre in 31st December 1981 process and militant activist in University of Science and Technology, Kumasi. May we use this occasion to reflect over the tasks ahead. Comrade Kwame Adjimah died in the pursuit of what he believed in. Sad as his death by shooting was, let it inspire us to re-dedicate ourselves to the struggle to make the world a better place for the downtrodden masses of our people. May the comrade rest peacefully in the arms of the ancestors. ALL POWER TO THE PEOPLE!!!! THIS CRY SHALL RING OUT FOR ALL OUR WARRIORS!!!! ALL POWER TO THE PEOPLE!!! ALL ROADS LEAD TO ATLANTA FOR EMERGENCY LEADERSHIP SUMMIT! 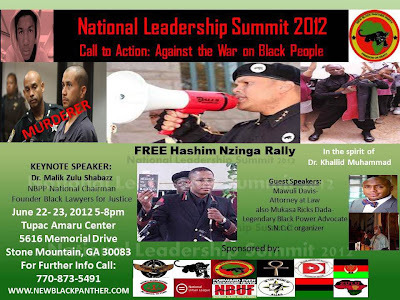 On June 22 and 23, the New Black Panther Party will spearhead what is being billed as 'An Emergency Leadership Summit' in Atlanta. The principal organizer and keynoter will be none other than the Party's national chairman and 'Attorney at War,' Malik Zulu Shabazz. Other key participants will include elder Black Power legend Baba Mukassa Ricks Dada and attorney Mawuli Davis and more! Key action items include a rally for Hashim Nzingha, the Party's chief of staff, facing bogus but serious charges in the aftermath of the Party's unveiling of its capture bounty on George Zimmerman, continuing pressure on the Zimmerman prosecution, standing down calls by the racist right wing to demonize the Party and to have the Party "investigated." This powerpacked weekend will take place at the Tupac Amaru Shakur Center, 5616 Memorial Drive, Stone Mountain, Georgia from 5-8pm. 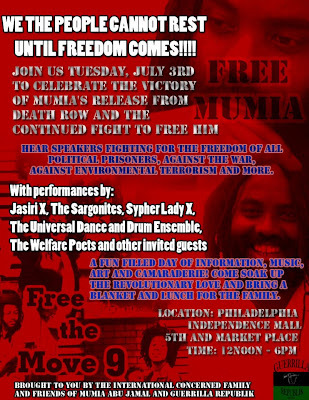 On July 3rd, the New Black Panther Party's national minister of culture, Baba Zayid Muhammad, will be among a sea of powerful performers celebrating Mumia's victory over his death sentence! "We fought long and hard for years to turn this ugly decadent date of injustice and repression on its head," Muhammad exclaimed, who has been committed to the case since for 22 years. "Now we must turn it into triumph and do whatever is necessary to free Mumia," he finished. At Philadelphia's Independence Hall, located at 5th and Market from 12 noon to 6pm. Revolutionary Journalist Mumia Abu Jamal was shot and framed for killing police officer Daniel Faulkner on December 9, 1981. He was sentenced to death by the infamous 'hanging judge,' the late Albert Sabo on July 3, 1982, in order for all participating jurors to be free to enjoy their holiday weekend. 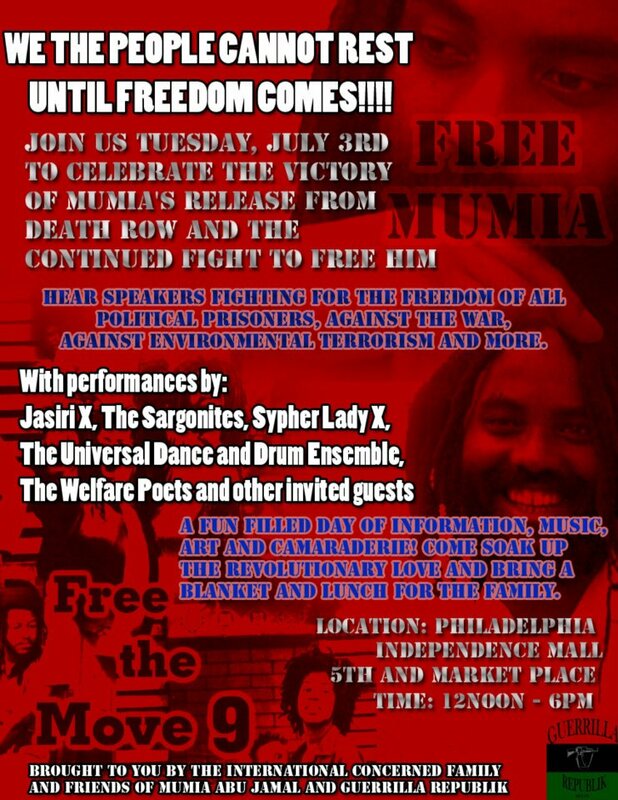 Mumia's death sentence was vacated just months ago and is now at Frackwille Prison, serving a life sentence. Supporters and progressive forces are now pushing for volumes of exculpatory evidence to serve as the basis for the vacating of his conviction. July 3rd will mark the 30th anniversary of that gross injustice. STOP POLICE BRUTALITY! JUSTICE FOR RAMARLEY GRAHAM! On February 2nd, Graham was stalked by undercover New York police officers who forced themselves into Graham's home. They shot and killed him in coldblood in front of his grandmother and 6 year old cousin. They suspected Graham of carrying marijuana. In the aftermath of his killing, Graham's family and other activists including the Party's Khadijah Shakur, a local hero on the medical front, have hosted weekly rallies in front of Graham's home every week for every year of Ramarley's life. They will do so up until July 19th which will represent the 18th consecutive week. Graham was only 18 years old when he was slain. June 16th until June 21st. Upcoming broadcasts are also being scheduled on Free Speech TV. Exact times will be announced. Also check our website for information about events in the UK next week. SATURDAY JUNE 30, 2012 11:00 A.M. - 1:00 P.M.
Every Saturday is Self-Determination Saturday at Songhai City Cultural Center, 3117 Master Street, Philadelphia, PA 19121. Come worship the Creator from 11:00 a.m. to noon, enjoy a light breakfast beginning at 10:30 a.m. Participate in sessions every hour to develop and increase self-sufficiency and self-determination. Session topics include Family Mental Health, Nutrition, Self-Defense, African Storytelling, etc. ; come for an hour or the entire day. Enjoy the Game Room throughout the day. Games include family and adult board games, ping-pong, pool, playstation, and games for toddlers. Computers are available with internet connection. For more information, respond through this email or call 215-769-3333. The Cabral/Truth Circle is a combination of a great film festival and an exciting book club that focuses on the history and political movements of Africa and the African Diaspora. The Circle, named after Amilcar Cabral and Sojourner Truth, focuses on the history and political movements of Africa and the African Diaspora through a film screening and highlighting of a complementary book. Every other month, TransAfrica shows a short documentary and hosts a discussion linking history and current affairs, and encouraging individual and collective activism. Panelists include: Mario Angulo, Palenque El Congal Buenaventura, PCN; Ajamu Baraka, Associate Fellow at Institute for Policy Studies and former Executive Director of the US Human Rights Network; and Charo Mina Rojas, Black Communities Process in Colombia-International Working Group (PCN). Film: La Toma by Paola Mendoza. La Toma documents the struggle of an Afro-Colombian gold-mining community in southwestern Colombia to remain on its territory. Home to 1,052 families, La Toma was founded by runaway slaves in 1636. Over the centuries, they have developed a culture and history that is tied to this land, carving out environmentally sustainable livelihoods through artisanal gold mining and basic agricultural projects, and grounding their traditions in this ancestral place. Despite a legal framework that protects the community’s rights to the land, multinational investors and right-wing paramilitaries have threatened, intimidated, and killed members of the community. Thanks to the strong organizational capacity and the community's will, in addition to transnational advocacy efforts that included PCN, WOLA, LAWG, and ACSN, the people of La Toma continue to live in the territory. However, private interests and armed militias continue to threaten La Toma in order to displace them and make way for large-scale mining operations. The U.S.-Colombia Free Trade Agreement (FTA) poses a threat to the people of La Toma and other communities undergoing similar experiences. 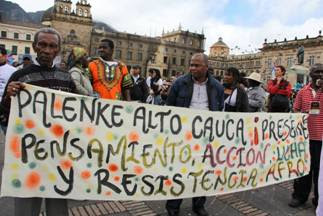 According to Colombian and international law, Afro-Colombian and indigenous peoples have the right to free, prior, and informed consultation and consent (FPIC) for any development project or public policy that will affect them; the FTA was not consulted with Afro-Colombian or indigenous peoples. Increased investment in controversial industries as a result of the FTA will undermine Afro-Colombian and indigenous peoples’ rights to self-determination and to the land. (Description from Washington Office on Latin America). For more information: 202.223.1960 ext. 137 or email mmunthali@transafrica.org. The Cabral/Truth Circle is named in honor of Amilcar Cabral and Sojourner Truth. Amilcar Cabral was one of Africa's most successful and thoughtful leaders. He led the anti-colonialism movement in Cape Verde and Guinea-Bissau. Sojourner Truth petitioned the government and won back her five-year-old son who had been sold illegally. She spent the rest of her days traveling throughout the country encouraging the debate to end slavery and the creation of a peaceful society. The venue is Busboys and Poets, one of the most exciting establishments in the Washington area. Busboys and Poets is a restaurant, bookstore and gathering place for people who believe that social justice and peace are attainable goals.Admission is free, but space is limited. We encourage you to have dinner with us and change the world. Friends of the Congo - HELP END IMPUNITY NOW IN EASTERN CONGO ! 2/ Contact the U.S. State Department, The White House and members of Congress and request that they hold the Rwandan government accountable for its actions in the Congo. The United Nations Organization Stabilization Mission in the DR Congo (MONUSCO ) recently revealed that the Rwandan government has a hand in the current instability in eastern Congo by giving support to the rebel groups National Congress for the Defense of the People (CNDP) and/or M23. This does not come as news to those who follow Congolese politics. Since 1996, the Rwandan government has acted as a major destabilizing force in the east of the Congo. Myriad studies and reports have documented how the Rwandan government has waged proxy wars through rebel groups, pilfering of Congo's resources and trading in hundreds of millions of dollars of conflict minerals. The report by MONUSCO is not surprising, but the carte blanche that the Rwandan government enjoys, especially at the international level, continues to boggle the mind. It would appear that the more Rwanda destabilizes the Congo, the more military equipment, training, intelligence and financial aid the government gets from its donors in the West. Timothy Reid's prescient article in the Harvard Policy Journal entitled "Killing Them Softly: Has Foreign Aid to Rwanda and Uganda Contributed to the Humanitarian Tragedy in the Democratic Republic of Congo?" captures the scale of the impunity with which the Rwandan government has operated in Congo with the full backing of its donors. A staunch ally of the United States and the United Kingdom, the Rwandan government has benefited tremendously from the diplomatic cover and protection that accompanies its relationship with such powerful nations - former New York Times reporter, Howard French explains. The United States has a law on its books that supporters of the Rwandan government both inside and outside the US government would wish to disappear. The Democratic Republic of The Congo Relief, Security and Democracy Promotion Act (PL 109-456), sponsored by Barack Obama and Co-Sponsored by Hillary Clinton when they were both Senators, was signed into law in 2006 by President Bush. Section 105 of Public Law 109-456 says "The Secretary of State is authorized to withhold assistance made available under the Foreign Assistance Act of 1961 (22 U.S.C. 2151 et seq. ), other than humanitarian, peacekeeping, and counterterrorism assistance, for a foreign country if the Secretary determines that the government of the foreign country is taking actions to destabilize the Democratic Republic of the Congo." Following a United Nations group of experts report published in 2008 documenting Rwanda's support for the CNDP and its leader at the time, Laurent Nkunda, Sweden and Netherlands did what the United States has not done to date; they held the Rwandan government to account by withholding financial aid. Subsequently, Rwanda demobilized the CNDP and placed Laurent Nkunda under house arrest only to replace him with Bosco Ntaganda as head of the CNDP. Now that Ntaganda has become toxic as a result of increasing demands that he should be brought to the International Criminal Court (ICC) where he is wanted for war crimes in the Congo, there is now an attempt to replace him with Sultani Makenga. Noted scholar of the region Rene LeMarchand stated in the Fall/Winter 2009, Brown Journal of World Affairs that Rwanda is a central actor who will determine whether the region is characterized by peace or war. Allowing more to die and add to the millions of Congolese already lost to the war and instability of the last fifteen years is unconscionable. It is time that the international community and Rwanda's allies, especially the United States, hold the Rwandan government to account. A good start would be to implement Section 105 of PL 109-456. Contact the U.S. State Department, The White House and members of Congress and request that they hold the Rwandan government accountable for its actions in the Congo. Follow FOTC on Facebook and Twitter to stay abreast of the latest developments! AFRICA/CONGO DR - Fighting in North Kivu, causing 80,000 displaced people, the missionaries denounce the "lies of war"
Le col. L. Marchal (MINUAR) est formel : les FAR ne disposaient pas de missiles de type MISTRAL - Que dit le capt Sean MOORHOUSE, rédacteur du fameux document qui a fait le tour de la presse internationale depuis vendredi 31/05/2012 ? Eighteen years after the historic '100 days of genocide' in Rwanda the United States Government has suddenly produced never-before-seen satellite images to support the genocide extradition trial of a former Rwandan now U.S. citizen in New Hampshire (USA). The existence of satellite imagery from 1994 would enable the 'international community' to further explore heretofore hidden facts about the double presidential assassinations of April 6 or massacres committed before, during and after 1994. As the world commemorates the official Rwanda genocide story on the 18th anniversary of the Rwanda genocide the people of Central Africa continue to suffer under the brutal terrorism of the Kagame military regime. Instead of celebrating, we should be asking: who are the real victims and who are the real criminals, and what really happened in Rwanda? Continue reading PENTAGON PRODUCES SATELLITE PHOTOS OF 1994 RWANDA GENOCIDE. "... When we consider the suffering and the scale of the atrocities in Congo, we cannot but recall our own 6 million victims of Nazi genocide. The "hear nothing, see nothing and do nothing" approach fails to fulfil the promise to "never again!" stand idly by while human beings are slaughtered. It denies justice to the victims and questions our very commitment to humanity. As rabbis we cannot ignore the call of our tradition: "Whoever destroys a soul, it is considered as if he destroyed an entire world. And whoever saves a life, it is considered as if he saved an entire world ..."